Help! how to improve the preformance of DS1054Z FFT mode? So now i wonder how to improve the preformance of DS1054Z FFT mode? Re: Help! 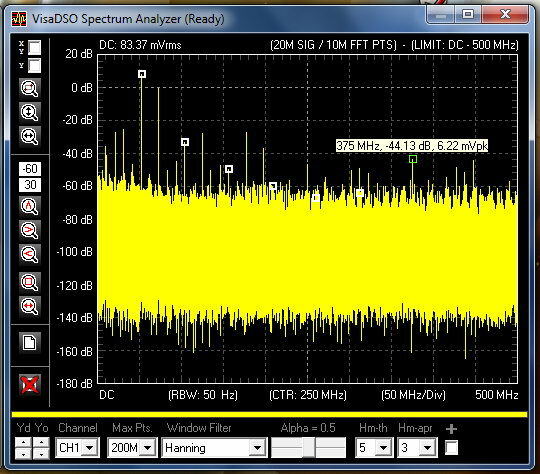 how to improve the preformance of DS1054Z FFT mode? Thanks Mechatrommer I just did the upgrade and it is quite an improvement. If you change the code a little, you can make it work via VISA over network as well. "to remain static is to lose ground"
will it work if the 100Mhz hack is installed? Even though the slow M68000 CPU can take more than 20 seconds to refresh the FFT if you go too far, you can select the number of points, real/imaginary/modulus, etc. I guess that, once you have the FFT implemented, it doesn't add any cost in performance terms to give it some flexibility. Umm, wow how did I miss this update. Can't believe that's from almost a year ago. It looks like it makes the fft function almost usable rather than the joke mine currently is. Does the firmware also allow the decode functions to work on the entire memory rather than just the displayed on screen trace? man, of course it does, it is simply, awesome! but still it is awesome!